The state's chief medical examiner, testifying at the murder trial of Timothy Danforth, describes the shot that killed Michael Reis. Damage was significant and the blood filled up the chest cavity and clearly was fatal, he said. A shot, considered by the state to be the first of three, grazed the top of the left foot and caused injury to a small toe. The shotgun wound to the right thigh, considered the second shot by the state, went through soft tissue and muscle from the outside to inside on a downward projection before it exited the body, he said. It ripped through a major artery and vein and was potentially fatal, the medical examiner said. Trevan Goodwin, 17, of Wilton, testified that he was walking home between 10 and 11 p.m. May 30, 2016, on Main Street in Wilton. He was texting and stopped to finish a text. Timothy Danforth had been sitting nearby and asked Goodwin if he knew Zach Uhlman. Goodwin said he asked, “Why? Who are you?” Danforth identified himself and told him he wanted to hurt Uhlman, not kill him, because Uhlman owed Danforth’s father $200 for a bag of marijuana, Goodwin said. Goodwin, who said he had been drinking, said Danforth had a gun on his hip but did not threaten Goodwin and never flashed the gun. Goodwin told a friend the next day about the comment about Uhlman. That friend texted Gary Brosius, 24, of East Dixfield, which kicked off a text war among Timothy Danforth’s father, Robert Danforth; Brosius; and Uhlman. Andrew Goding, of Wilton, said he went to Danforth’s home on June 1 and when he was approaching the door, he saw in his peripheral vision a black object raised. Danforth said it was only “Andrew” and the black object was lowered, he said. When he went inside, a black handgun was on a table and Timothy Danforth was sitting on the couch beside it. Goding said he did not see a shotgun. “I really did not think anything of it,” said Goding, who admitted under questioning that he was there to get marijuana. He testified that he spent the majority of time speaking to “Rob” Danforth in the kitchen but also talked to “Tim” Danforth. Goding said he had been warned by one of them not to come over because of a situation involving Uhlman, Brosius and the Danforths. Goding said he gave Danforth his opinion on self-defense. Neither Danforth appeared to be frightened, he said. 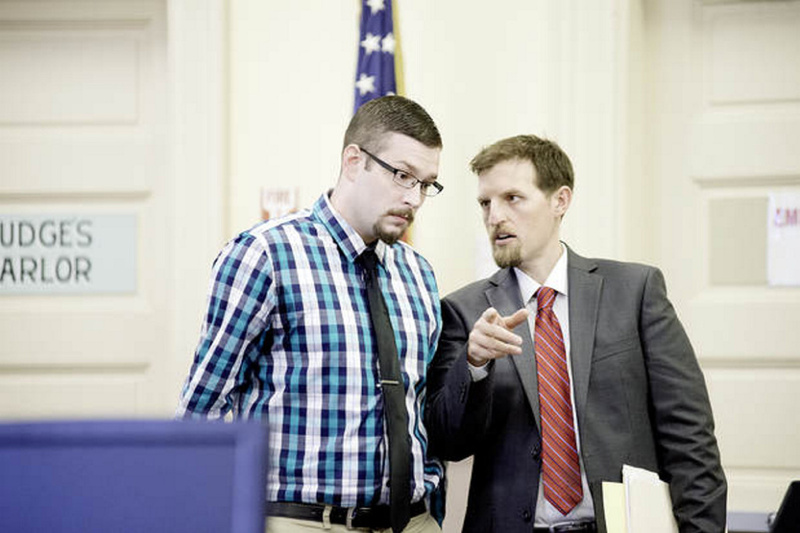 Another witness, Matthew Kerr, 26, of New Sharon, had been the one to go to the Danforths on the night of the shooting to act as mediator between Brosius and Uhlman and the Danforths. When the group of six including Brosius, Uhlman, Reis and Kerr went to the Danforths, the driver parked the car on the road. Kerr said he walked to the driveway and when he started down he heard a shot, put his hands up and said, “It’s Mattie, Matt Kerr.” He was invited onto the porch. He testified that Timothy Danforth was near the grill and his father was near the door. He initially told a Maine State Police detective the opposite, according to a review of the police interview. Kerr said he told the Danforths that Uhlman and Brosius were in the car and they were waiting to talk or fight. A previous witness had said Danforth had yelled that the next one who came on the property would be shot. A short time later, Reis came walking around the corner of the trailer with hands up and Timothy Danforth shot him three times as Reis put one foot on the step to the porch, Kerr said. There was no physical confrontation between them, he said. After Reis, Kerr’s childhood friend, was shot, Kerr picked him up and put him on his shoulder and yelled for help, Kerr said. As he was running up the driveway, Reis fell off his shoulder. He finally got him to the end of the driveway and they got him into the car. They rushed to the hospital, but Reis was declared dead after they arrived.